Soak the ciabatta in the tomato juice until softened. Add to a food processor along with the tomatoes, red pepper and garlic and blend until smooth. While the food processor is running, add the oil in a steady stream, then add the vinegar. Season to taste. Refrigerate for one hour, then stir through one cup of ice water if it needs to be thinned out. 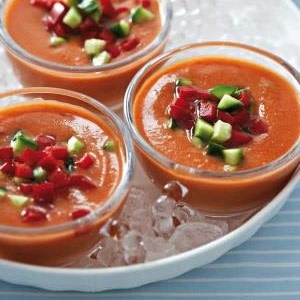 Serve chilled and garnished with chopped red pepper and cucumber.